Karen Martin Reads: Post 51: Tree Surgery for Beginners meets Five Rivers on a Wooded Plain! Post 51: Tree Surgery for Beginners meets Five Rivers on a Wooded Plain! And the snuggle chair? Well, the idea behind it is that it is very cosy for two...or alternatively, it provides ample space to curl up by yourself and read for hours at a time! The cat has also decided it is the best chair in the house for stretch room; we can sometimes be found vying for available space! Since I last wrote, hubby and I have signed up for a 26-mile charity walk for Macmillan Nurses. This takes place in July, so expect to get regular updates! We are now the proud owners of bottle green t-shirts, and training has begun. We did have long-legged Child 2 as our pace-maker on a speedy 7.5-miler this weekend, so maybe we need to employ him to accompany us...for the first few miles at least. The astute amongst you will have realised that it is marathon distance, so we really need to pace it if we're going to complete the challenge in a day. We're aiming for about 9 hours, but we'll see. Thanks to those who have kicked off the fundraising. If you feel moved to spare a few coins, find us on justgiving.com/fundraising/KarenBriCotswoldChallenge. Now onto life's readathon. Don't you find, whenever you are in a bookshop - whether it be somewhere huge like Foyles, a boutique like London Review of Books, an Oxfam charity shop or an independent that somehow survives despite Amazon - that you are struck by how many titles there are, and you know that your lifetime isn't going to be long enough. There is so much to learn, so many stories to uncover and authors to discover. My latest read is by a favourite of mine, Patrick Gale. The title is appealing in itself, and I found myself wondering if I might acquire a few woodland skills as I opened the pages of Tree Surgery for Beginners! It begins by setting the context of the town of Barrowcester and the protagonist Lawrence Frost, who has grown up there. I have to admit at this point, that I wasn't as gripped by this novel as I have been with all other Gales. It is indeed an earlier publication and if you haven't yet sampled any of his writing, I wouldn't start with this one. The recent A Place Called Winter is significantly more accomplished. I began with Notes from an Exhibition, and that is a splendid read. Lawrence Frost discovers in the first chapter that his wife and daughter have disappeared. It transpires that he may well be the cause of their departure as he recalls drunkenness, shouting and jealousy over a work colleague. The story then takes many twists and turns, moving away from Barrowcester via a bridge cruise that takes in Miami,the Virgin Islands and California. If this geographical sweep isn't broad enough, there is also an incident with a tiger, the curiosity of an androgynous cabaret singer, a murder, a tragedy and long-lost relatives. I'll concede that the plot isn't the strong point of the book. But it does have a heart. 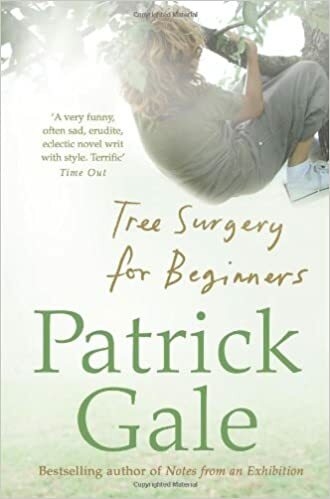 You can see the embryonic writer here, the Patrick Gale who will eventually guide you through people and their lives and emotions with total empathy. There is hope in this novel, a hope that no matter what befalls us as a human race, we can love each other through it, we can help each other to heal. It is not trite; the human angle is its strongest strand, but the story arc that supports its purpose is not comparable with the sophistication of his later novels. From an early Gale to the debut novel of Barney Norris. Cutting his storytelling teeth with a string of very highly acclaimed plays, this first novel is accomplished. 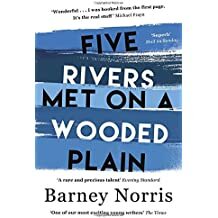 The premise is romantic; set in Salisbury where five rivers meet on a wooded plain, there is a strong sense that we are a part of a much bigger history. In its foreword chapter, The Burning Arrow of the Spire, Norris details how generations of settlers have been drawn to this corner of Wiltshire to live their lives. This big backdrop remains at the heart of the novel as he begins to tell the stories of five individuals whose lives merge in this place. But the novel is cleverer than that. I was duped into thinking that I would have five separate narratives whose stories would conjoin at a given point, but it is more sophisticated; whilst there is a central device of a car accident, not all the characters are directly involved. More, it serves as a catalyst where we are privileged to be allowed access to their lives at a given point. The first character is Rita the flower-seller, whose colourful language and existence serve as an antithesis to the romanticised depiction of Salisbury given in the preceding chapter. Her life seems to be over as she faces up to who she is and what she has done. There is a swift change in tempo and writing style as Sam is introduced. He is a teenager who is remembering the scared boy he had been, whilst the reader can still see the fear that lies just beneath the veneer of foetal maturity. His story is about him facing up to an unpleasant reality, and one where no-one has the words to explain or express themselves. In the middle of his story the car crash occurs. He witnesses it and moves on. Another character is a beautifully constructed elderly man in his eighties who has just lost his wife. The portrayal of loss and old age is finely drawn and written to evoke a natural empathy. There is Liam, a drifter and a drop-out who is just sitting it out in his home town without really understanding why he is there or what he might do next. And there is Alison, the army wife who lives in fear of the phone ringing or uniformed personnel turning up at her door to tell her of her husband's demise at the hands of insurgents. The novel reads like a series of short stories with an integral thread. The centrality of the story is that we live for a mere whisper of a moment before we recede into history. The setting evokes such considerations, as Norris makes us aware of the number of people who have gone before: from the ancient settlers, to the druids, to the early christian populations and now the secular mass of modern commuters. The cathedral is simultaneously a metaphor for the safe and the temporal. Beneath its shadow people live their lives, occasionally coming in for succour, but mostly ignoring it. "there is a grace to cupping your hands and catching your life as it pours past you, holding it close for just a few moments before..new water, new time flows over..."
This is a novel that beats to natural rhythm of place and human experience. The narratives are all singular and the changes in tone, pace and style make this a stimulating read. It is quiet and unprepossessing, and yet, as I turned the book closed, I said to hubby with a sigh that it was a novel that had got my heart.